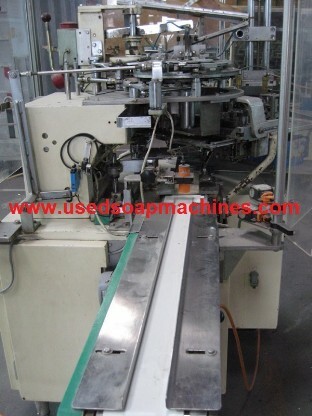 ALPMA V64 stretch film soap wrapper is studied to wrap oval and rectangular soap bars with and without side band at a maximum speed up to 25 soap wraps per minute. The soaps are manually placed into the pockets of the circled chain. 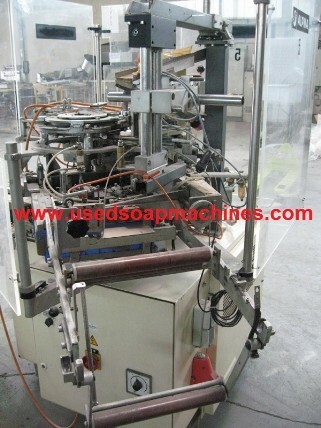 This prevents the surface of the soap from being damaged during the infeed process. 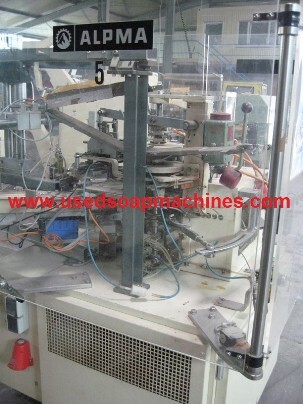 The soaps are lifted from the pocket chain by a vertically operating piston. They are then pushed through the PE film cut-off in the stretching station and taken from the top dead center by grippers. The stretched film is closed by an iris diaphragm. The excess film is cut off by a heated blade and then automatically discharged. The soaps are removed from the stretching station by means of a rotating suction star and transferred to the labeling station. Finally the soaps arrive to the discharge station. They are placed onto the discharge belt with the label facing down.